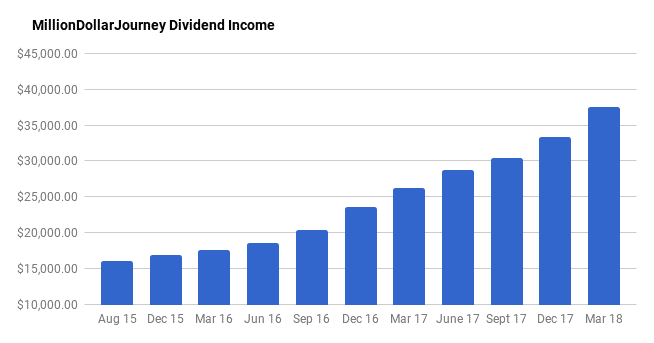 We finished off 2017 with some solid progress by reaching $34k in passive dividend income. While it represents just past the halfway mark in our financial goal, it also means that we hit another milestone of having over $1M invested across our portfolios. In September 2017, I wrote about being laid off from my government job after which I was given a temporary position for a few months. While being laid off doesn’t feel great, I was looking forward to the opportunity to try something new. In the December 2017 update, I wrote about being in talks with a number of potential employers, mostly from my professional network. As a bit of good news to start off 2018, I managed to land a position back with industry. It has been a great change thus far with a lot of new challenges. I’m back in heavy learning mode, which might be my favorite phase when it comes to anything new. Now, let’s talk a bit about my passive income strategy – generating dividend income. As dividends are the main focus of my passive income pursuit, there is a large dependence on the market. While there are merits to this investment strategy, there are also substantial risks – particularly dividend cuts. Riocan (REI.UN); Telus (T); Canadian Utilities (CU); Canadian National Railway (CNR); Kimberly Clark (US: KMB); Metro (MRU); Chevron (US: CVX); Exco Technologies (XTC); Manulife (MFC); Suncor (SU); Bell Canada (BCE); Great-West Life (GWO); Brookfield Infrastructure Partners (BIP.UN); Coca Cola (US: KO); AbbVie Inc (ABBV); TransCanada Corp (TRP); Walmart (US: WMT); Magna (MG); CIBC (CM); Scotiabank (BNS); Bank of Montreal (BMO); TD Bank (TD); Husky Energy (HSE); Canadian Western Bank (CWB); AT&T (US:T); Visa (US: V); Abbot Labs (US: ABT); Wells Fargo (US: WFC); Power Financial (PWF); Transcontinental (TCL.A). In addition to the dividend raises, I’ve continued to deploy cash into dividend stocks. In the last little while, I created a non-registered dividend portfolio for my spouse (opened another account with MDJ reader favorite Questrade). There was some cash savings in her account that needed to be deployed, and I was able to get it invested in short order. As one of the goals of this particular account is to generate a high and reliable yield (spouse is in lower tax bracket), I am experimenting with the Dogs of the TSX strategy. What also has boosted the dividend income over the past quarter is the volatility in the market. With higher interest rates (and more to come), dividend stocks have been hammered. I get excited and go shopping when the market gets volatile, especially when strong dividend stocks are sold off with market panic. As you can see in detail below, over the last quarter we have increased our dividend income from $34k to $37.5k which represents a 12.44% increase quarter over quarter. One stock to watch over the next couple of quarters is Enbridge (ENB). This stock is being sold off due to high amounts of debt (almost as high as its market cap). High debt combined with increasing interest rates equates to high debt servicing costs. Is it possible that the dividend is at risk? Mangement has promised 10% dividend increases over the next couple of years, so we will have to wait and see what happens. Another big move in the market is the buyout of Canadian Real Estate Investment Trust (REF.UN), which is one of my favorite REITs due to its history of dividend increases. Who’s the buyer? Choice Properties (CHP.UN), which is the real estate arm of Loblaws. The acquisition will make Choice Properties the largest REIT in Canada with a diversified mix of assets. I will be sticking around and converting my REF.UN units to CHP.UN. Here is an update on the dividend totals per account. Some readers were questioning the value of “Yield on Cost”, so this update has the current yield on each portfolio. This also means that a more relevant “total invested” number is shown below. Before it was just my cost base, now it’s total portfolio value (ie. including capital gains/losses). Through a combination of deploying cash, continuing to build a new non-registered portfolio with savings, and collecting those juicy dividend increases, this quarter has been productive with a 12.44% bump in dividend income. I really do enjoy watching those dividends flow into the accounts. The “total invested” amount did not increase much even though the portfolio is generating more dividends because dividend stocks are underperforming right now (ie. market values have decreased). I’m not too concerned about the drop as I’m more focused on the amount of actual cash that my portfolio generates. As previously mentioned, I welcome corrections/volatility as it gives investors in the accumulation phase a chance to buy quality companies (or index ETFs) at better prices, potentially increasing long-term returns. My plan is to continue this pace and hit $40k in dividend income for the next update and $45k by the end of 2018. We shall see! Do you put a cap on the weight any given stock may have in your portfolio? For instance, I try to keep each stock under 3% of the total portfolio so that it can only affect a small portion of the portfolio if it ever tanks. Do you have a similar cap? Good question Ian! I have a cap of 5% for any single position, right now my largest positions are all under 3%. I looks like you are heavily investing in your corporate account for dividends. What percentage of your corp account is invested in dividend producing investments? If you don’t mind me asking. Right now, most of my corporate cash has been invested in dividend stocks. The end goal is to flow through the dividends to shareholders (ie. me) once I stop earning a regular salary. Impressive, looks like we have a long way to go before catching you. I think Q1 we will get about $4000. What’s your plan to RRSP withdrawal since the $60k goal includes contributions from RRSP? When it works out tax wise (ie. when not earning a salary), i’ll likely start withdrawing dividends from the RRSP. At that point, it may get close to my personal deduction amount. Haha it’s not a race for sure. Good to have someone ahead of our journey so we can learn from you. If you plan to draw dividend from RRSP, do you think you’ll be able to recover from the withholding tax? Wow, every time when you post a update I have been always very impressed with your progress. In this pace, you will get to your $60K goal in no time. I was very slow this year at buying new stocks. Market volatile made me uneasy. Thanks for the kind feedback May! These updates keep the pressure on to keep investing my cash. I understand your uneasiness with the volatility. Best bet for that though is to take the long view. If you think you will still like the business in 10-15 years, then jump on the opportunities today and collect the dividends along the way. Yeah, I tried to do that, but some stocks I bought on dip continue to have new 52-week low again after I bought them. That’s why I am very hesitating now to buy stocks. At the beginning of this year, I have maxed out RRSP and TFSA and invested fully there. Those new investment are in water now. I still have quite some cash to invest and kind of struggle everyday with the question “Buy or not Buy”. Forgot to say congratulations on your new job. My husband had experienced that last year too. Thanks May. I suspect that volatility is in our future, but make sure to stick with your long-term plan. First of all thanks a lot for sharing your experience, thoughts and results. Where can I see how many stocks/etfs you have and at what price did you buy them at? Hi Jag, our TFSA’s is where we hold REITs and other high yielding dividend stocks. We treat all of our accounts as one big portfolio. Amazing!! So good. Are you going to max out the passive income in the corporation to $50,000 to avoid the increased taxation? How many years until grade school for your kids? The $60,000 annual dividend to cover living expenses could be achieved easily when your living expenses fall- in your other post you mentioned the kid’s activities will probably be halved, to about $6000, which will reduce your annual expenses and then your target ;) But I am pretty sure you can achieve the $60,000 by 2020, especially if there is a huge market correction. Hi GYM, thanks for the encouragement! I’m going to max out the dividend income in the corp as much as we can, but we don’t have over $1M in the corp account – maybe someday! The kids are well into grade school now, my oldest is 10 and my youngest is 7. We are doing our best to keep the activities reasonable. We have a philosophy of trying a bunch of things and see what sticks! As they get older, we find that it’s higher concentration in fewer activities. I’m pretty confident that we would have a comfortable lifestyle at $60k. Even if I scale back full-time work, I’ll still have capitalistic pursuits – maybe some consulting and continue with the online biz. I’m an average person and this maybe sounds off-track, but I have to start somewhere and I need your assistance, please. I will keep it short, I promise. Basically, in 2020 I will be mortgage-free, no debts, car paid, kids have grown, no spouse ( Widow ) Self-employed ( no Workplace pensions ). I’m ready to invest 50K per year in dividends. I have $0 in RRSP, 0$ in TFSA Why? I was busy raising my 4 kids alone. Now, I’m on my own ( free like a bird ) age 55. My goal is to generate 500K in the coming 10 years, I’ll be 65 then and all of it as dividends in TFSA with shareowners Investment Inc. ( since it’s too late for me to start RRSP anyway. Pls correct me if I’m wrong! I might be ). I will postpone my CPP and my OSA until 70 years old. As of today, I have room for $57,500 in TFSA already. My yearly income is $75,500 and my whole living expenses do not exceed 25K including property tax. I work from home, so no use of a car but for groceries only. -Food & household supplies $8,000/year ( 2 person daughter still living @ home ). -Home utilities ( Hydro, heat, water, internet, phone, Netflix, website ) $4,500/year. -Home & car insurance $1,500/year. -Car maintenance and Gas $500/year. Why do I want to save 500K? because I can. And if I don’t start now and commit myself to a purpose or a goal, my $$ will be wasted. ( I’m very generous with my relatives and can’t say No. ) Also, I want to catch up to lost years raising my lovely kids ( now 3 great young successful men and a sweet young girl ). I have bee educating myself for the past 2 years in saving & investing for retirements and it becomes almost like a hobby to me. Now, that I’m ready I have some questions that I’d like you guys out there help me with. 1- I’m I on the right track if I only invest in dividends now and I’m looking to 20 years (buy- hold- reinvest) down the road and have a future dividend income ( 75 old ). Yes, I’m healthy don’t smoke/drink…boring life, but I want to travel for a while. 2- Since I’m planning to invest 50K per year, how is tax will apply to me. ( as self-employed minus all expenses ) my net income is around $38,000. 3- I want some help starting today. How do I start? Go to my bank ( RBC ) or go to a Stock transfer agent? where do I find them in Ottawa? Thank you very much in advance for your time and effort, I appreciate you all and I’m an avid but slow learner from your website and like most of you looking to achieve a comfortable and a happy retirement. Hello LA, really sounds like you need a financial planner to run all the numbers for the best method to invest your savings. I would suggest that if you do decide to invest in dividends, make sure to keep those investments in a tax-sheltered account. Only after your TFSA (invest TFSA first) and RRSP (you will benefit from RRSP contributions with your income) are maxed out should you consider opening a non-registered account. Instead of picking individual dividend stocks, I would suggest a conservative index portfolio that is easily rebalanced once a year. Thank you for your prompt reply. Cheers! As you are getting closer and closer to your target FIRE date, are you excited or nervous? What will be some of the first activities on your to do list when it comes to this date? How do you prepare yourself mentally for this milestone? I am really curious to know what’s going through your mind as this date approaches. Great question Leo. Maybe it’s my personality, but I didn’t get overly excited when I hit the $1M mark, and I anticipate that hitting the passive income number will be the same. It will be a good feeling, but I will likely continue working in some capacity. I treat these events as more of milestone rather than the finish line. What about you? As I am getting closer to my target net worth number, I started to feel less and less pressure about my current employment. Let’s face it, if you are not self employed, there will always be a chance that you may not have a job tomorrow regardless of how stable the organization that you working for. In another word, I worry a bit less about my job as I know that if either my wife or I lose our job, financially, we will be able to manage with one income. 1. are you dripping your dividend stocks in any accounts or taking the cash and buying other stock or adding to your ETFs ? 2. In a corporate account it looks like you can have over the 50k in passive income if your annual corporate earnings are below the 500k limit. Some people I know are looking at doing SWAP ETFs from Horizons to create all capital gains which at the moment are taxed more favourable upon selling. Do you have individual dividend generating stocks in your corp and drip them? I don’t understand how the RDTOH accounts will work works regarding eligible dividends and non eligible dividends with the new tax rules- is there a strategy to minimize taxes with this that you will use? 1. I am leaving my dividends as cash as I like having control of where I deploy capital.